Health information mangers are responsible for the collection, analysis and interpretation of data in any organization or business that makes use of health or patient data information. People in this field work in various health places such as hospitals, nursing homes and home health agencies. They are required to stay up-to-date on computer and software technology, as well as legislative requirements dealing with medical records. They also must ensure that only authorized personnel have access to these medical record databases, which must be accurate and up-to-date. The field of Health Information Management is growing rapidly. Over the last few years, the federal government has invested billions of dollars in the field to promote the design and development of a robust health information infrastructure. As a result of private institutions following suit, the Bureau of Labor Statistics projects a 16% growth in related health information jobs. My favorite things about the literary art festival is the celebration of writing, the creativity the space carries and speaking to the guest speakers. 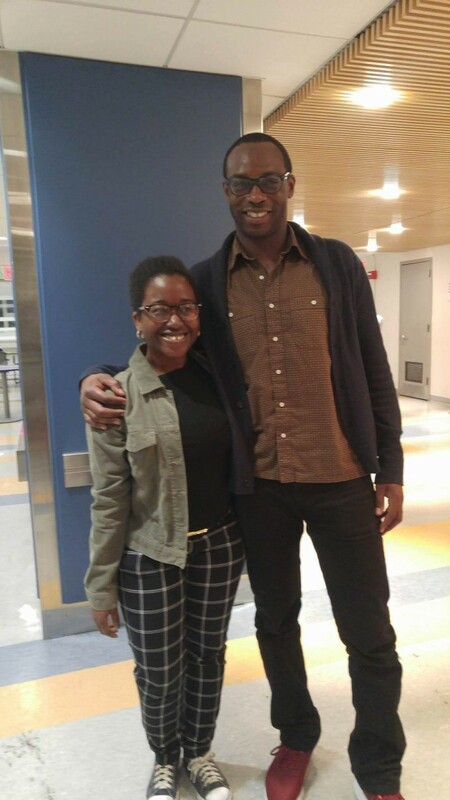 From participating in this event i have gotten the chance to meet two writers, Mary Gaitskill and Rowan Ricardo Phillips. It is always nice to question a writers motive behind their work and tell them your own ideas from reading their work. If you are someone who enjoys writing, plans to have a career as a writer or just have a literary work that you’re pleased with, I’m here The Literary Arts Festival. 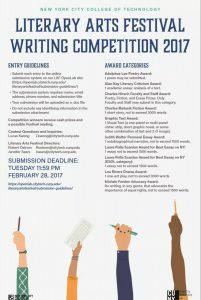 The Literary Arts Festival (LAF) is a writing competition that takes place every year to celebrate the writing of students, faculty and staff. Students are highly encouraged to participate in this event by submitting their literary work for the many categories that can interests them. 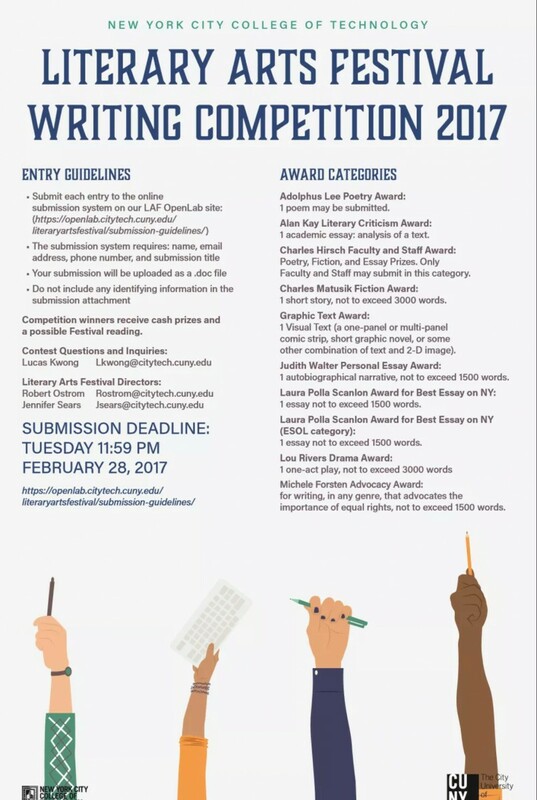 Upon submitting their writing it must be anonymous and they can only submit one entry for every category. Winners of these categories not only get to celebrate having their work be considered amazing enough to win but also win prizes and have the opportunity to read their work during the night of the festival. The festival itself is an awesome event that has entertainment such as the City Tech Step Team, cool introduction videos by the LAF volunteers, and guest speakers whose works students have been reading in class for that semester. This year we even had a singer serenading us with angelic vocals. Last year I found out about this event from my English professor and decided to not just volunteer with the LAF team but also submit an essay I had written the previous semster. I sent my work just to take a chance on it. I was just proud of that essay and decided to submit it. Yet, one morning a friend that had also submitted her own writing texted me to let me know that I was one of the winners. Learning this left me in disbelief and delighted. It also reminded me that no matter the career path I chose, writing would always be something I’m passionate about. Have you ever wondered what career field is responsible for bringing attention to new clothing departments and fashion trends? We’ll if you have the answer is fashion marketing. When most people think of fashion marketing, usually think it is only about the advertising. To get consumers curious or eager to purchase products and new lines yet, there is more to this career path. The field of fashion marketing covers a wide variety of positions. One can work as a fashion buyer, customer service representative, retail store owner, visual merchandiser, retail manager, manufacturer’s representative, operations manager, marketer, advertiser, and more. Those interested in this field not only should have an eye for fashion but also business skills. If the path one chooses to follow under the umbrella of fashion marketing is fashion buyer they have a chance of traveling. Traveling the globe to identify new trends before deciding which lines to purchase for a retailer. Depending on the size of the store you work for, you may be responsible for purchasing many types of goods, including shoes and accessories, or you might only handle one area, such as formal wear. In this position, you would work closely with designers, suppliers, and marketers to ensure that the lines you buy would maximize profit for all parties. An associate’s and bachelor’s degrees are available in fashion fashion marketing. Having either of these degrees could help one find entry-level work in the fashion merchandising and marketing field. Many of these degree programs focus on practical, hands-on skills and offer students the chance to complete high level projects, obtain internships, or study abroad in the fashion capitals of the world. Psychology is a science that studies the mind, behavior and focuses on a myriad of topics. Some include understanding certain aspects of life, treatment of psychological disorders and how experience/surroundings can affect individuals. Almost everything can be viewed through a psychological perspective. Things like the states of consciousness, social psychology, the different ways of learning and even the interpretation of dreams. It is for this reason that research and theories are tested. During my time at City Tech I have taken three psychology classes. The first one was Introduction to Psychology which informed me of the background and theories of the field and made me aware of some concepts. The second, Child Psychology made me look deep in myself and past to identify what attachment style I had and how my upbringing influenced the person I am today. And finally, pyschology of Adolescence and Adulthood in which I did service learning to go out into my community and help those that were less fortunate. If you happen to be someone intrested in biology, sociology, understanding the brain and behavior, a career in this field just might be the one for you. There’s an extensive list of psychology careers that people can choose from. Careers such as Military psychologist, Physical therapist and Child abuse counselors. Programs and degree paths are available so make sure to do some research on the ones that spark your curiosity. Thank you for reading. How is your academic self-discovery going? What cool career paths have you found or intrested in? Feel free to let me know. A large production company, studio or broadcaster may employ a Production Accountant or qualified Accountant as a Financial Controller, to manage the finances of all of the company’s activities, including those of individual productions. On larger productions, a freelance Senior Production Accountant may work as a Financial Controller to oversee the work of the Production Accountant and Accounts team. The role of a Financial Controller is very challenging. They are responsible for controlling the accounting, taxation and financial analysis for all of the work a company does, including development, production and distribution. Financial Controllers may supervise one or more full-time Assistants. On individual productions, Financial Controllers normally help Producers and Executive Producers to prepare budgets and raise finance, taking into account any relevant Government tax Incentive schemes. Financial Controllers may undertake some or all of the Production Accountant’s activities. This can include tasks such as controlling cash flow so that payments are made on time and setting up and managing the Accounts team. You will need a BA degree in Accountancy to become a qualified Accountant and then to have a number of years’ experience, ideally within film production, media or film finance. To become a Financial Controller in permanent employment in a production companies you will usually need to be a Chartered Accountant with a solid grounding in company and commercial accounting. Freelance Senior Production Accountants who work as Financial Controllers on large films must have an excellent track record on large film productions. For many, the career they’re interested in perusing will require them to take classes that can be challenging. Some students when faced with this situation will push themselves and dedicate more of their time to the subject. They will do this because their goal is reaching the career they’re passionate about. While there are other students placed in the same situation that can discover the field they initially thought of going after might not be the right one for them. There is nothing wrong if this happens. It just allows students to find out what better suits them. When sharing stories with other students, the class we usually struggle in common with is math. Math and I, from time to time, can be friendly towards one another yet we are never really friends. I’m a liberal arts and science major (LAS), currently in Pre-Calculus and will have to go up to Calculus 2 (1575), and what drives me is the fact that I need to pass these classes to get my degree. I’ve had moments where the problems on the board or pages look like hieroglyphs. When taking exams I can sometimes forget methods or even go blank. Yet, the moments that I do understand how to solve something it is one of the best feelings of accomplishment. There is no shame in getting help. This applies to every subject. If I am unsure, confused or struggling with a topic, I can ask the professor during or after class, I can go to tutoring, study with friends, etc. What works best for me is doing the problems over and over and explaining how to get the answer to someone else. Repetition, writing and explaining help with remembering what steps to take to solve the problem and my thought process to getting there. Mentoring is a way of passing down knowledge from one person to another, yet it is also deeper than that. It is also about helping the mentee gain confidence in themselves and for whatever it was they had difficulty with. That for me is the goal to have during the journey to academic self-discovery. Recently I was given an allegory on how impactful mentoring can be for all whose involved. The allegory goes like this: there is a dark room and inside are people holding candlesticks without flame. Then walks in a person with a candle that is lit. This person decides to share their light with another and now the room has a faint amount of light, however, it is still not bright enough. If the two share it with more and those they share it with do the same with the rest, eventually the entire romm will become illuminated. That is what mentoring is about. Giving “light” to those that are in need of it. Mentorship is the act of teaching and learning, gaining information from those with more experience. This has been done for years and years and though we might not have called the people who are our gardians, siblings, friends, or teachers “mentors”, that is in a way what they are because they all contribute something to our lives. Most mentors have an insight on how things work from their own experiences, due to this they are able to give their mentee the best advise or support needed. Mentors in the field the mentee is attempting will know the right ways to push and motivate them to continue. It is not only the mentee that benefits form having a mentorship, the mentor also gains from this. The mentor will have the chance to test their skills and what they know and they most likely will be filled with the sense of purpose and accomplishment from helping others. There are many programs and internships people can look up and join that involves mentoring. One of the programs that I know has mentoring opportunities at City Tech is BMI (Black Male Initiative). Despite their name they are open for all (women and people of other races). They provide academic help and guidance to make sure students do not just succeed but help others to succeed as well. I’ve heard personal stories of growth from members of that program, such as them being once too shy to speak to an audience to now being able to stand infront of a crowd and speak almost fully at ease. Mentorship is a great way to add something intresting to resumes, a great way of helping others and your community, a chance to improve at the things one struggles with, and so much more. Have you ever been a mentor or a mentee? How was your experience like? If you want to share just leave a comment below. Thanks for reading. “Everything you want is on the other side of fear”- Jack Canfield. I’ve touched on this subject before but fear is something that can often cause miss opportunities. It might hold one back and make them doubt themselves and/or their goals. When it comes to me, I get really anxious and start talking myself out of things I will want do, however what I have found helps me to combat fear is taking those chances anyway. Some of the ways I do this is by joining and taking part in things that spark my interest, for example writing. Writing makes me realize that the experience gained when not letting fear get in the way is greater than letting those chances go by. Writing is a great form of expression for me and it is a way of connecting, so finding out about cool events or projects (Literary Arts Festival, Seek Ink and The Buzz) that deal with writing, I knew I had to put myself out tbere. To which I endes up glad that I did because they helped me challenge my craft and encouraged me to step out of my comfort zone. The possibilities of exhibiting your skills are endless. There are opportunities in schools and online. If one were to prefer starting with something less out there, I would suggest joining clubs or workshops at their school. This works well because it allows the output of creativity as well as learning and sharing from their fellow club members. While if someone is more comfortable with the thought of participating locally, looking online for projects, contests or residencies could be the way to go. There are a myriad of sites that have programs one can apply for. This can be a stepping stone for their career or be something that looks great on their resume. I think it is important for someone to take a chance and put themselves out there, despite fears and doubts. The outcome will do more to benefit them in the long run.